As we come to a time of feasting, family, and giving thanks, we place peace at the forefront of our minds. Holidays are an easy time to promote peace; generosity, goodwill, and community tend to be hallmarks of the holiday season. However, peace not only permeates our homes during the holidays but it thrives in our classrooms all year long. 1. Define the word peace by discussing examples of what it does and doesn’t mean. Guide your child in conversation about how to treat others with peace and how it feels to her when something is not peaceful. For instance, our students had the conversation about what is peaceful and what is not. Students said that birds, flowers, and kind words are peaceful. Being mean, pushing, and using hurtful words are not peaceful. 2. Promote healthy conversations about conflict resolution. In our classroom, students who have disagreements are prompted to express how it made them feel. These conversations bring about peacefulness because it allows children to share their feelings and be heard. When a child is heard, he feels respected, and where there is respect, there is peace. 3. When conflict does occur, use a tangible item to help your child initiate a conversation about her feelings. We use what is sweetly called The Peace Rose, which is a fabric rose that students can hold. One student will hold it in front of another student and say how something made her feel. The other student, then, gets a chance to hold the rose and explain how he is feeling. The rose passes back and forth until the students come to an agreement or forgiveness. 4. Participate in an annual event such as International Day of Peace on September 21. Encourage your child to share poems and create artwork about peace. Our class constructed Pinwheels for Peace and decorated our playground with them. We sang songs about peace and worked with MSH elementary students create a beautiful school-wide art project. Each student traced his hand and thought of something that made him feel peaceful to have written on the hand print. 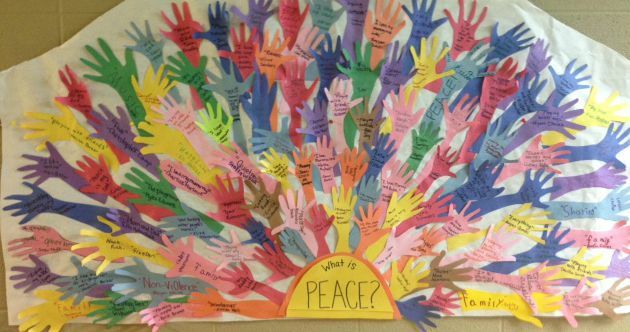 This is a great way to feature the vocabulary of peace and to provide meaningful ways that children can share what they’ve learned. 5. As children get older, they can participate at a higher level by researching and writing about peace and peace education. Our class is very young, so our words and actions are the main focus of our peace education. By Kindergarten, students will be able to write and create artwork to explore their ideas of peace. 6. Allow your child to take care of her surroundings. At MSH, students care for their classroom, class pets, work space, playground space, and each other. Showing care and respect for their environment teaches peace because students will become at peace with their surroundings. Our students sweep, fold, brush, and wash every day. They water plants and pick up after themselves. They organize works and put them where they go. By taking care of our classroom and showing materials and people respect, we are advocating and practicing peacefulness. 7. Emphasize peace throughout the nations, respecting and highlighting different parts of the world, their customs, and their culture. While studying geography, introduce a spirit of peace while viewing each culture. When we talk about different areas of the world, we speak of their attributes and their friendly customs. Students begin to identify themselves as global citizens which fosters in them a sense connection and responsibility for the world they live in. 8. Be a good, peaceful example to your child. Tell him by showing him how to talk to other adults, children, and teachers. Speak respectfully about others, modeling kindness and sincerity. Children will learn more from how you show peace than by what you say about peace. 9. Start a special holiday or ritual for your home. This can include joyful celebrations as well as sad occasions (like the loss of a pet). Everyone can share in the planning, decorating, and celebrating. With these tips in mind, may we continue to establish peace in our home, our school, and our world. May our children see how we lovingly treat the world around us so that they soak up every ounce of that, and be the generation that truly displays peace.